My wife did it. She got Quinny off the bottle this week. That ends a streak of nearly 4 years of dealing with and using bottles every on a daily basis for the two of us. Well, we have paid our dues and we are finally beyond the bottle stage. Some say that is sad, but I say bring on potty training and learning how to buckle their own seat belts. Then we will finally be getting somewhere. Meanwhile, out little boy is bottle free. He is truly a champion. It was not a good day for entertainers. Farrah Fawcet died earlier in the day of cancer. She was “the” supermodel many of us grew up with whose fame peaked with her role in Charlie’s Angels. Then, just hours later, Michael Jackson suddenly died of a massive heart attack. He was just 50. He was one crazy person, who had a tragic life yet brought us an entire new sound and style. there may never be another album ever produced as popular as Thriller was. He was my geneation’s “Elvis” and now he is gone. Quinny is one funny dude. As he approaches turning 2, we have learned that he is far superior in abilities than his age! He can repeat anything he hears – including “Oh Crap” which he said one day from the backseat with Daddy driving. He can say his ABCs perfectly. He says “Mommy” about 100 times a day and he says “No, no Daddy” while waving his hand and giggling when I come calling for him. He can climb anything and does so all the time. He eats with a fork or spoon while refusing a high chair our booster seat – he has to sit like an adult. He can sing most songs he hears – especially “Happy Birthday Dear Becky” (his aunt). He can open all doors, turn everything on or off that he wants and he can watch you do something one time and nearly figure out how to do it himself. He is one smart little man. It has been just over a year since we became a family of 5, but certainly he pulls his own weight equal or more than the girls do combined. I have always thought there is something very special about this child. He has the brains, the personality and even the looks to set the world a blaze! I still cannot believe I have been a “daddy” now for 4 years. On top of that, a “daddy” to three. Who would have thought…. 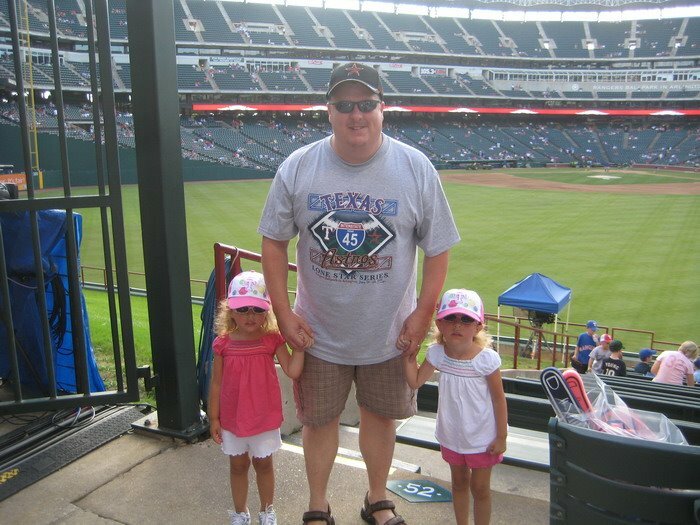 This week was special as I took my girls together to a Rangers/Astros baseball game Thursday night. It was the twins night at the Ballpark in Arlington! It is something I do ever year now. We made it through the 5th inning, even though we only sat down for about 3. The rest were spent playing in the kids areas out on homerun porch. It was a big night including Pudge Rodriquez set the MLB record for games caught and President Bush was in attendance that night too which was special. Not often you get to be in the same building with a former President, especially one we now wish we had back in office! 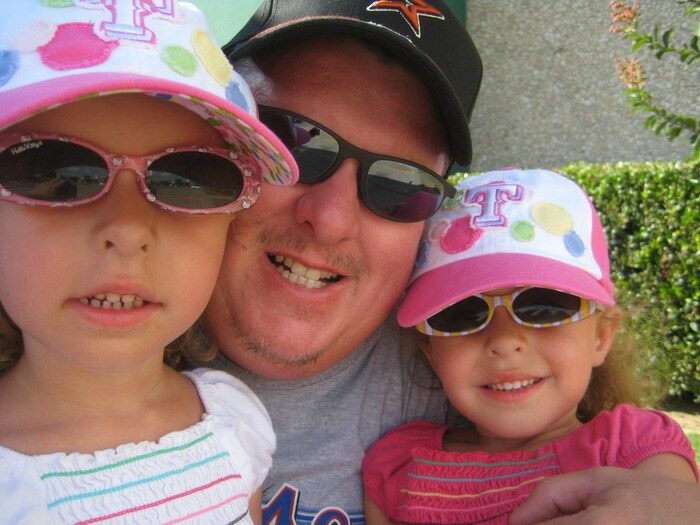 It was a great time and next year my “daddy” date with Quinny at a Rangers game will be added to the mix! 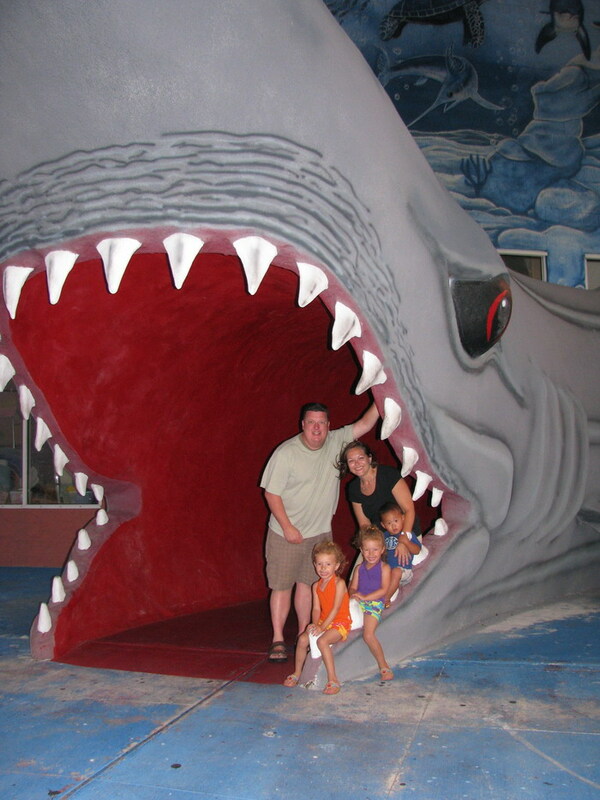 Usually the family heads down to the Galveston area each year, but this go around we decided Port Aransas would be our destination while Galveston continues to recover from Hurricane Ike. Needless to say, we truly enjoyed the quick 5 day getaway while staying at a nice condo on Mustang Island. The beaches were incredible and the private pool sure made the ends of the days relaxing and clean. The Texas State Aquarium was also a hit with the kiddos. Of course, nothing compares to the stop at Sea World on the way down. No one is bigger to them than Shamu….well, maybe Mickey.